Melissa Rosenberg discusses the core team of Jessica Jones season two. Chris Chalk sets up Lucius Fox’s journey on Gotham. Plus, what’s to come on Ash vs. Evil Dead, and new looks at Fear the Walking Dead and The Exorcist. To me, my Spoilers! 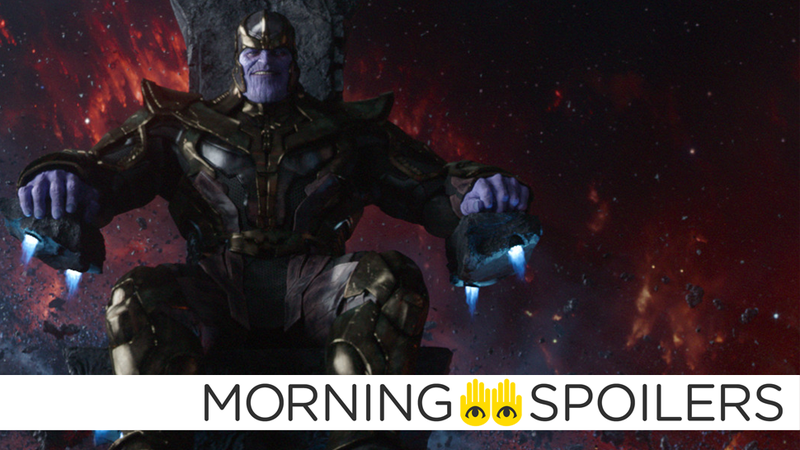 Latino Review claims that the movie will indeed by heavily based on the original Infinity Gauntlet arc from the comics, including Thanos gathering the Infinity stones so that he can wipe out half of all life in the cosmos to woo the personification of Death. Death, as she was in the comics, will also supposedly be female in the movie, just as in the comic—although there are conflicting rumors that Cate Blanchett’s Hela may take her place in the movie. Probably best to take this all with a pinch of salt. Alexandre Desplat will compose the score, hot off his departure from Rogue One. A new TV spot—made up almost entirely of footage from the most recent trailer—has been released. I learned from working on Dexter that you can advance the character, but you never want to cure the character/ With Dexter, the moment he felt guilt or accepted that he was ‘bad,’ the show’s over. He’s no longer a sociopath. The equivalent for us would be if Jessica somehow recovered from the damage that had been done to her. People don’t just heal, you don’t go through that just to say, ‘Oh, he got arrested, he’s in jail, I’m OK now.’ That trauma is a huge part of who she is now. Knowing where Lucius ends up, have you seen a moment that graduates or transforms him into the character we know from the comics? I don’t think we’ve gotten to that part yet in the show. I think the good thing about being pre-Batman is no one knows this part of the story. The only time it’s really talked about is in flashbacks in the comic books and graphic novels, but there’s never been a straight narrative of this part of the existence of Gotham. So I haven’t yet seen the thing that makes [Lucius] go, ‘Oh, that’s how I can help. That’s who I am in this world.’ I don’t think we’ve gotten to that point yet, because we’re all kind of bumbling and stumbling into becoming these people. If we were already smart enough to make all the gadgets and strong enough to be Batman, there would be no need for this story. But we’re stumbling, we’re making all the mistakes and we’re not quite up on how dangerous these villains are. So we’re taking risks and failing. Also, the city has to get so disgusting, so violent and so broken that there is a need for Bruce Wayne to become Batman. For Lucius Fox to really aide who becomes Batman. I don’t think Gotham is destroyed enough for him to see the likes of who he’s going to be. Eleanor is enlisted to help Michael with an important task that could determine her fate in the Good Place. Meanwhile, Chidi agrees to be the third wheel in an effort to help out his friend. Here’s an extensive interview with the cast, looking towards what’s coming in the new season.